What a week. It’s not everyday someone can say they were quoted in a newspaper, let alone pretty much all of them and interviewed for most of the major television stations in the UK. I have that unsettling – and frankly, unwanted – claim to fame. Here’s the story, and you might want to get a cup of tea because it’s a long one. And it went nuts from there… There’s no way this should’ve become news. But, here in the UK, we have a summer holiday season where people are stressed about their kids and cramming in a vacation that will hopefully have good weather and won’t make them broke, the government is on holiday (ridiculous, considering Brexit is looming) and the news media is desperate for UK-interest stories. This is “silly season” and so my opinion about signs became national news. 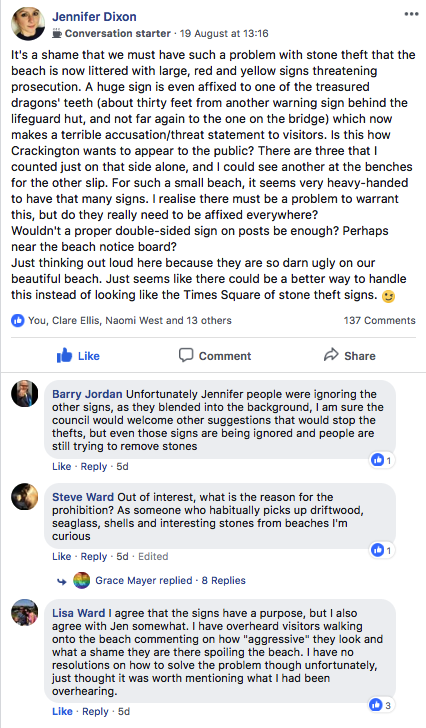 What started as a discussion on signs (number, size, language, and placement) became a watered down national debate on whether a person can/should/shouldn’t take a stone from a beach. You can imagine how that has played out. Heck, just do a Google News search for some keywords, and read the comments in any of the papers. Twitter has some pretty shouty opinions on this too. And it all stems back to a story within the story told by the parish clerk, Barry Jordan, about a holidaymaker who was seen stuffing the boot of their car with bags of stones from our beach. The individual was tracked down and threatened with a £1000 fine if the stones were not returned. They apparently drove a significant distance to avoid the fine. This angle is far more interesting than my comment on the ugly proliferation of signs, so the media latched onto it like fire on a dry field. The first interview I did was for The Guardian newspaper. They phoned, I jabbered nervously about the signs, they asked about the stones. They asked for photos. I was completely blown away that this was making news, but the BBC had already put a story online and so the fire was started. The next few days are a blur of ringing phones, emails, interviews, and finally television appearances. All over stones, and some minor mentions of the signs, which, by the 20th (24 hours after my initial Facebook post) had been halved in number as the parish council listened to the village feedback. I do not regret my initial Facebook post on the matter, and although I too believe in preserving our beach, I have a little softer approach on the topic of a stone or two. Beach combing is a pastime for many and I don’t personally believe the removal of one stone will cause major ecological upset, but I also know that removing one stone times thousands of visitors can add up. I do weekly beach cleans, so if I see someone loading up a rucksack or pram, I do stop to talk to them about the protection act. I’ve never been shouted at or challenged, and people seem genuinely unaware it’s illegal to take stones. For that reason, signs are necessary, of course. But, given that my first job out of design school was at a sign company, I know that they could’ve been better designed and implemented. But none of that matters now as the original point of the story has been lost to people all over the country either shouting about their god-given right to pocket rocks, or defending the earth and its every pebble, or condemning the governing bodies of Britain for telling them what to do and wasting money chasing pebble pinchers. A huge, national argument has sprung up because my village had the nerve to ask for its stones back, and I don’t even disagree with them doing so. So, I’ve been filmed for ITV, BBC, and then had a live, primetime interview via FaceTime with Sky News. That was the most terrifying thing I’ve ever done in my life. I spoke to a black screen, only hearing the story before my segment and then the questions from Kay Burley. 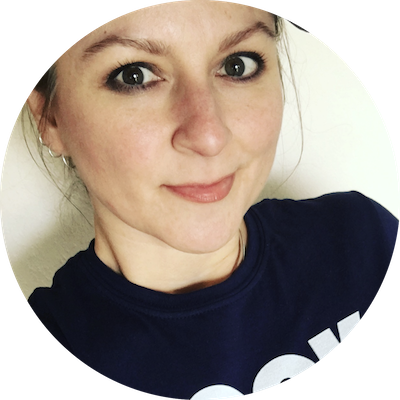 I had no prep, no idea what they’d ask, and my experience with live tv started there. Having no visual feedback – no facial expressions of the presenter to read – was hugely disconcerting. I tripped over my final words. My friends snapped photos of me on their tvs and said I did great. I’ve watched the ITV and BBC segments. I did my best, but especially with edited segments, the media will still present the story in the way that they think will get the most views and people talking. It has never been about getting my side of the story right. Thursday arrived and my final appearance was a photo with Barry on the beach for the Bude & Stratton paper. 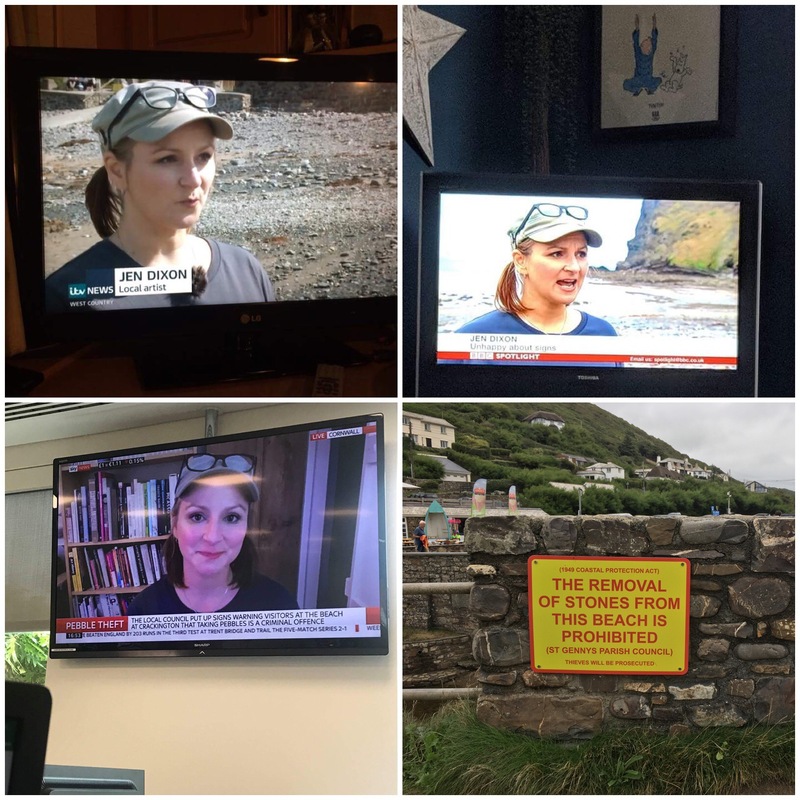 The reporter is someone who has covered our beach clean activities and keen to make sure the story is presented properly. Too little too late, perhaps, and being a local paper is unlikely to make much of a splash, but I am grateful. After the photo was taken around noon, I had a coffee by myself, thought about everything, went home and cried. I didn’t do much after that because as a person with mental health issues including anxiety, I was absolutely drained. I pottered around the house a little, played video games, cried more, and went to bed. I hadn’t cried all week because I didn’t know if someone would want my photo or me on tv and I couldn’t risk puffy eyes and terrible sinuses. I had a week of crying to catch up on. Friday arrived and I stayed in bed for most of it. Then I did some yoga. I had my regular video catch up chat with Aaron in Wisconsin, and then went to bed. Today, I’m processing the week in words and preparing to lay low and get back to my version of a normal life. So why didn’t I say no to any of the interviews? It’s easy to sit back and say “you didn’t have to do any of that” and in a way you are right. But here’s the thing: it didn’t happen to you and it’s impossible to understand the strange current you get swept into when it does. Also, I believe in seeing things through and to not at least try to present the factual basis of the story would have been a failure on my part. I put an opinion out there, it got picked up and twisted, and I’m not a person who backs down, even at the risk of my own mental health. It’s how I’m wired, and so I see things through. And now, I’m I week behind in my work, regaining my strength after a week I wouldn’t wish on anyone, and trying to get back to a normal life. Perhaps the next time I am in the papers and on tv it will be for my art or some amazing beach clean activity. I do hope so. You know how much love and respect I have for you for what you do for our beach, even more so now for not only what your intentions were this week but, more importantly, the cost at which it has come to you. You may not be able to quantify it or even necessarily feel it right now, but so many people locally are so glad that you were there to give a rational, calm, and intelligent voice ( be it American, Scottish and/ or Cracky!) to what was blatantly being presented as a sensationalist news piece focussing on the wrong points. Thanks to you the world now knows that what at first seemed like a ridiculous row, was actually a genuine conversation piece, as well as highlighting how badly things can be done when left in the hands of less than a dozen individuals who make decisions for the rest of us. That was one extraordinary week – one in which you consistently handled the situation with apparent calm and dignity. To have been thrust onto a national platform , which the media then painted a different colour, must have been deeply unnerving. But you came through it with your integrity intact. Those of us who live here know how much work you put in to preserving the local environment. The weekly beach cleans are the best example I’ve ever come across of a community activity where people neither feel coerced nor compelled to join in, but when they do, they find that it helps them as well as the beach. The fact that the story spiralled into a completely different one was not of your doing, but utterly jaw dropping to watch. As ambassadors go though, you were pretty top notch. Thank you.